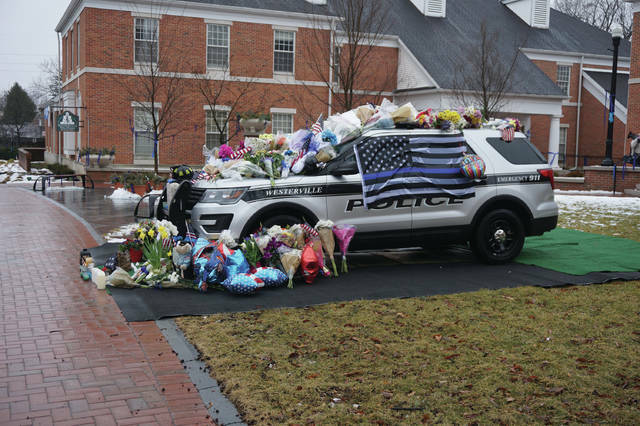 Officer Anthony Morelli’s police cruiser was decorated with flowers, flags, balloons, and other tokens of appreciation at Westerville City Hall on Sunday morning. Blue ribbons, blue lights, flags at half staff, stickers and signs in memory of Officers Eric Joering and Anthony Morelli are a common sight in Franklin and Delaware counties. This home is in Westerville. The crime scene where two Westerville Police Officers lost their lives on Crosswind Drive was blocked off on Sunday morning. It was a heartbreaking weekend of crying, praying, embracing and remembrance in a community reeling from the deaths of two police officers killed in the line of duty. 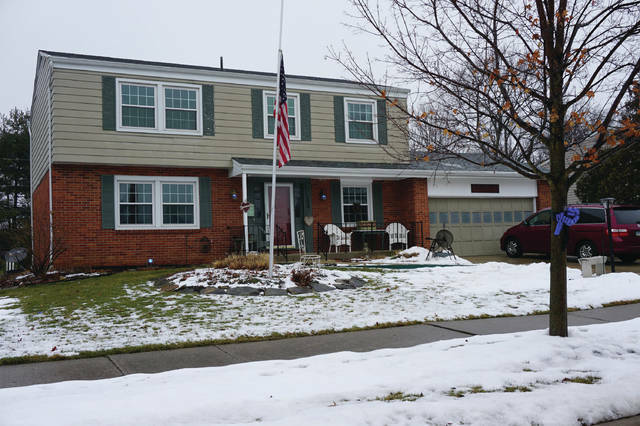 On a rainy and gloomy Saturday afternoon, many residents in Central Ohio were shaken from their chores or Winter Olympics-watching by news that two veteran Westerville Division of Police officers, Eric Joering, 39, and Anthony Morelli, 54, were ambushed and shot to death when responding to a domestic violence incident on Crosswind Drive in Westerville. The suspect, Quentin Smith, 30, was wounded and charged with aggravated murder. The tragedy triggered an outpouring of emotion and support in the city of 39,000; as well as throughout the state and nationwide. While the crime scene was being roped off with red tape, trees and signs throughout the area began to sport blue ribbons, and blue lights shined on front porches. Flags were flown at half-staff, and flowers and other tokens of appreciation were piled high on the police station’s steps, later to be placed on and around Morelli’s cruiser at City Hall. On a rainy and foggy Sunday afternoon, hundreds of people gathered in Westerville North High School’s gymnasium in Delaware County. Mindy Drayer organized the event, an opportunity for people to express their feelings of sorrow and support, or to recall anecdotes about the officers. Police Chaplain Jim Meacham said that Eric Joering’s K-9, Sam, who was at the scene but unhurt, was brought home to his grieving family. Joering was a 1997 graduate of Westerville South High School. Members of the public remembered Morelli as always smiling and made an effort to establish relationships, whether serving as security at the Westerville Public Library or as a student resource officer at Blendon Middle School. One woman recalled Morelli confidently located her missing 7-year-old daughter at Giant Eagle. Sobbing, she said he remembered the daughter’s name a decade later during a chance encounter. Many of the speakers were crying, as were many of those in attendance. At first tentative in wanting to speak, soon there was a long line of people wanting to share their memories of the officers or to thank them for their sacrifices. “This should not have happened. Let us pray this will never happen again here. We are Westerville strong,” were among the sentiments expressed. Early Sunday evening, a prayer vigil was held at Heritage Christian Church on Maxtown Road in Westerville. For an hour, pastors from Westerville and elsewhere prayed for the officers, their family and friends, the police department and city employees, and for the nearly 1,000 people in attendance. On a bright and sunny Monday afternoon, thousands of people lined the streets of Westerville to honor the fallen officers. Separate caravans of cop cars, over a mile in length, made their way to the Moreland and Hill funeral homes in Westerville. At least three helicopters buzzed overhead. 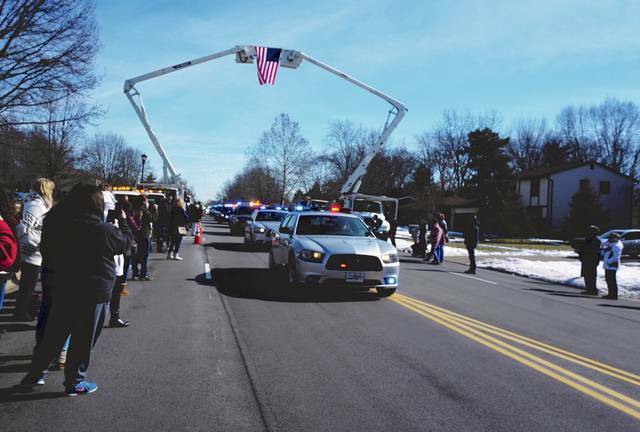 Cruisers from the City of Delaware, Delaware County Sheriff’s Office, Genoa Township, Sunbury, Powell, Dublin, Columbus, and all over Franklin County pulled in front of the funeral homes, their flashing lights a sea of blue occupying all the lanes of the streets. The show of support from the other jurisdictions will continue at least through the week as the Westerville Police Department will take that time off to process and heal from their losses. Police from other area departments will cover for them, just part of their job to serve and protect. https://www.delgazette.com/wp-content/uploads/sites/40/2018/02/web1_officer-morelli-s-cruiser.jpgOfficer Anthony Morelli’s police cruiser was decorated with flowers, flags, balloons, and other tokens of appreciation at Westerville City Hall on Sunday morning. https://www.delgazette.com/wp-content/uploads/sites/40/2018/02/web1_blue-ribbon-blue-light-flag-at-half-staff.jpgBlue ribbons, blue lights, flags at half staff, stickers and signs in memory of Officers Eric Joering and Anthony Morelli are a common sight in Franklin and Delaware counties. This home is in Westerville. 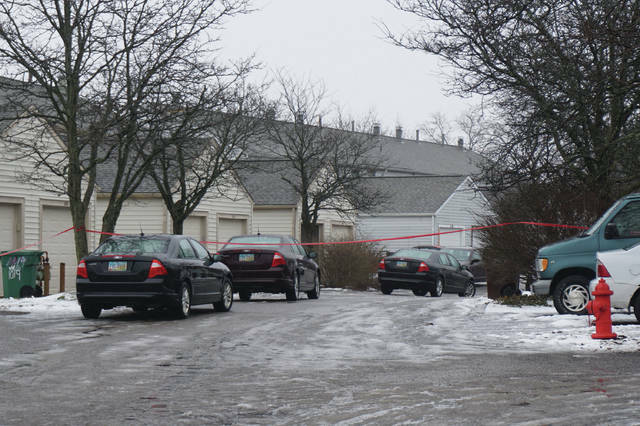 https://www.delgazette.com/wp-content/uploads/sites/40/2018/02/web1_crosswind-drive-crime-scene.jpgThe crime scene where two Westerville Police Officers lost their lives on Crosswind Drive was blocked off on Sunday morning. Gary Budzak may be reached at 740-413-0906 or on Twitt @GaryBudzak.